On March 12, 1881 an unnamed reporter for The New York Times described the life of an artists’ colony at Ecouen, France. According to this international correspondent, he and a colleague traveled to Ecouen on February 13, where he filed the following report: “..the little art colony of Ecouen, a town eight miles from Paris, accorded us a warm and gracious welcome. Ecouen is well known in all art circles as the home of Edouard Frère. It was here that the master evolved his new school and produced the quaint interiors and life-like figures, especially of children, that have made his name so famous. Through the intercession of our hostesses, we were admitted to the atelier of Frère, and at a moment when he was at work. Or rather he suffered himself to interrupted so that we might explore the secrets of his treasure-house.” After providing a vivid description of the four rambunctious ‘gamins’ who were posing for Frère at that moment, the writer goes on to describe the ateliers of André Henri Dargelas and his father-in-law Théophile-Emmanuel Duverger, among others. “M. Dargelas we found at his easel, and a bright-faced model who had just been released from a trying pose not far off. The artist was at work upon an amusing picture of a group of urchins just caught in the act of smoking a pipe by a young but austere pedagogue. Other pictures in a less advanced stage were those of a roguish youth clad in the garments of a remote ancestor, acting as physician to an invalid doll nursed by a little lady of about 10 years, and a merry group gathered around a Christmas tree.” [i] This description captures the essence of Dargelas’ work. 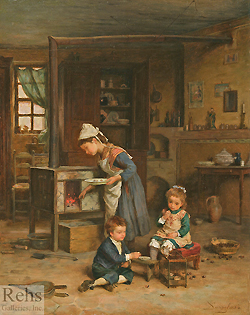 Securely rooted in the artists’ colony at Ecouen, he focused on genre scenes of children in a variety of situations, ranging from the schoolroom to the family dinner table. Although born in Bordeaux on 11 October 1828, Dargelas made his way to Paris as a young man, where he was admitted to Ecole des Beaux-Arts on 6 April 1854. There he studied with the successful academic master, François Edouard Picot, who instructed his pupils in a neoclassical style reminiscent of his own teacher, Jacques-Louis David. Within three years, Dargelas began exhibiting at the annual Salon exhibition, creating compositions that demonstrated his mastery not only of standard academic formal techniques, but also his awareness of the increasing demand for imagery that spoke to the contemporary life of the French bourgeoisie. In a painting such as Leaving Mass (1863) for example, Dargelas created a beautifully rendered architectural environment in which a modest middle class family is shown leaving church on a snowy Sunday while their children delightedly scoop up snowballs along the way. The muted brown tone of the buildings against the leaden gray sky is animated by the occasional splash of red or blue in the children’s jackets or capes. In short, the composition is based on established academic principles and traditions while the subject matter references a more nuanced depiction of the successful bourgeois family during the Second Empire. Several years later, the Salon of 1863 was a success for Dargelas; he exhibited three paintings, including Leaving Mass. However, the succés de scandale of the Salon des refuses overshadowed much of the official Salon art that year, and perhaps encouraged a certain disdain for the work of artists who were affiliated with mainstream venues. Henri Fantin-Latour, himself no stranger to academic painting, wrote to James McNeil Whistler in July 1863 that the “students of Picot conformed to academic principles rather than displaying innovation.” [ii] Such commentary reflects the voice of vanguard painters, but it also exaggerates the division between academic realists and the circle of Edouard Manet; Fantin-Latour might have been more credible had he carefully studied the Realist qualities of Dargelas’ work. Like so many other young painters eager to depict modern life, Dargelas strove to capture ordinary both working class and middle class existence without sentimentality or forced moral commentary. As he forged his career as an independent artist, Dargelas increasingly focused his attention on images of children, continuing to work in the naturalist style of other Second Empire painters such as Alexandre Antigna. These paintings often presented a civic lesson, underscoring the virtues of newly available public education for children or the value of a Christian upbringing. Paintings such as Morning Prayer combines these elements in a composition of schoolchildren reading from their prayer books as a nun leads them in their daily devotions to the Virgin Mary, whose sculptural image rests on a lace-covered shelf surrounded by candles. Once again, Dargelas presents a carefully structured, but subdued architectural setting that serves as a successful counterpoint to the occasional bright colors in the children’s clothing. In this supportive environment, Dargelas successfully developed a market for his paintings. Although he certainly sold his work to Parisian collectors, auction records indicate that the most substantial market for his painting was in London and New York. The English taste for childhood scenes was well established by the late nineteenth century, while American collectors looked almost exclusively to Paris for cultural leadership. In addition, the gallery business in both London and New York (as well as Boston, Philadelphia and Chicago) was considerably more developed than in Paris, where the long-standing dominance of the official Salon had hampered private enterprise. Dargelas’ compositions were especially suited to private galleries where collectors in search of modestly sized and beautifully painted work were most likely to purchase. His consistently elegant scenes of respectable—and charming—middle class families were combined with a naturalist approach that emphasized realistic depictions of weather, clothing, and the built environment while simultaneously presenting a gentle example of socially acceptable behavior and ideas. [i] “The Studios of Ecouen,” March 12, 1881, The New York Times. [ii] Henri Fantin-Latour to James McNeil Whistler, 11 July 1863, Letter #01078, Correspondence of James McNeil Whistler, University of Glasgow. [iii] Nancy Mowll Mathews, Mary Cassatt: A Life, (London & New Haven: Yale University Press, 1994), 44-45.